With special permission, I am going to add, hopefully every day, Vanessas daily messages and affirmations she gets from her Angels. 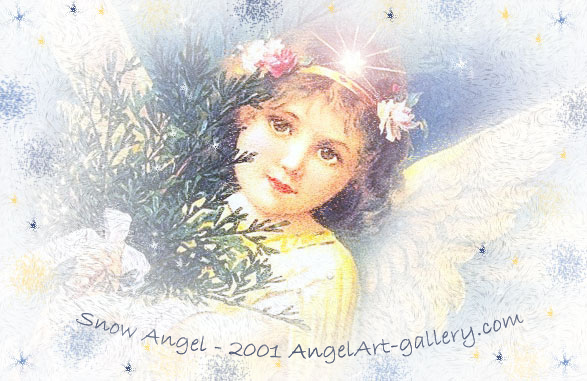 Vanessa has a web site of her own where she puts her Angel messages, so you can go visit her site as well. She also has a daily mailing list that you can subscribe to and get her daily Angel messages in your mailbox. This Awaken to Angels! Net Ring site is owned by TamiShan . I am the Angel of Golden Days filling your spirit with... Enthusiasm and Faith. Greet this day as it is... a golden day filled with blessings! Your inner divinity is real and through Spirit all things are possible. When was the last time you had a golden day where everything seemed perfect? A day when every traffic light you come to is green, when something you especially want is on sale, or when an answer you have been waiting for comes to you immediately. A day like this may seem important, but every day can be a golden day when you are living it in spiritual awareness. Recognizing your oneness with Spirit strengthens your faith to meet each day with great expectations of blessings. Greeting each day with enthusiasm fulfills new pportunities to discover Spirits blessings in your life. When you remove yourself and your concerns out of the way and accept Spirits love and blessings your life is enriched in every way. Letting go and letting God invites Divine Power to move into your life blessing you immeasurably. Give Spirit the chance to show you how wonderful life can be! I invite Spirit into my life everyday to show me how wonderful life really is! I am the Angel of Agelessness bringing you countless opportunities for you to become all that you can be! Each day you are reborn to a life of happiness and love. Rejoice and give thanks for life! Let my light show you the way. Accept my gifts of... Joy and Gladness! divine pattern of Joy and Gladness. living expression of Spirit's love and wisdom. Life may be divided in blocks of time but the basis of your existence is in eternity. Don't go through life with thoughts of slowing down because you're aging. through life with a youthful outlook and spirit. I am the Angel of Making Things Happen willing you to keep up your spirit! Approach life with a willingness to learn and grow. Your path is filled with... Inner Peace and Blessings! Each step brings you closer to realizing who you are and what you came here to accomplish. Inner Peace is found in Love and Wisdom. Each step on our path assures growth through two qualities our Souls possess. These qualities are Wisdom and Love. Listening to the Souls innate qualities fills life with Inner Peace and Blessings. will to choose given to us from Spirit enables us to live freely. The freedom of choice enriches life keeping it vibrant and exciting. Each day we have the choice to trust that Spirit will prepare the way for us or we can live life in fear of what lies ahead. My first choice would be to trust in Spirit to prepare the way. This leaves you free to make great strides not only materially but also in Soul growth. Let love rush in to fill the empty places in your heart and mind. Doing so puts you well on your way to Inner Peace and Happiness! I trust Spirit to prepare the way for me leaving me free to be the best at what I choose to do in life. Inspiration and Transformation. I offer you reassuring hope and energizing light. Rebirth is important to your spiritual well being. Bask in the sunshine of each new day! The yearning of our Spiritual nature is an inner urging directing us to be fully aware of Spirits presence in our life. Spirits unlimited love for us guides us every step of the way and nourishes our Souls. Our spiritual renewal grants us the riches of life. With direction from Spirit and angels we know we do not have to control all of the situations we face in life. Their guidance provides strength and faith that there is a fair outcome for all we encounter while we hold steadfast to the path we have chosen to follow. different for us when we begin. We are given proof that walking is learned and we are given all the tools we need to progress on our spiritual walk through life! I am in tune with my Divine nature and I fulfill my Divine potential with help from Spirit. I am the Angel of Growing and Unfolding presenting you with... New Beginnings and Endurance. All of your ctivities and time is part of a divine plan that is unfolding and revealing itself to you. Feel the glory in knowing that this new person you are becoming is the real you! Every day is a new beginning! Each moment you can begin again and you don't have to repeat the same mistakes over and over again. That in itself is a miracle of miracles! You are always prepared for a new beginning when you dedicate your heart to being a part of Spirits divine plan that is unfolding right before your very eyes. thing you do unfold in harmonious, orderly ways. Spirit gives you an inexhaustible source of divine energy, tap into it! Divine order maintains all creatures big and small, it rules the universe, it governs you. So allowing it and not fighting Mother Nature so to speak you bring order to what might seem to you the most impossible situation. Let Spirit work through you and add quality to your life! All I AM is part of Spirits divine plan! direction. I want your journey to be filled with... Harmony and Trust. I want you to share your journey and insights with someone who is very close to you. Sharing with love opens the way to spiritual growth. Conflicts are resolved when harmony dawns on you. Let go of viewing a situation as troubling and see it through the eyes of your guardian angel. Look past the surface and see it in a different light. Holding an elevated viewpoint sparks miraculous healings in all of your relationships. Conflict drops away and reveals the clean and new truth about everyone and everything in your life. Disappointments can erode the faith in yourself, others, and Spirit. The angels wish you to know how important it is to hold on tight to your Faith. They want to emphasize the value of self-trust. Mistakes do not erode your true nature. You have Spirit within you and your trust in Spirit will strengthen the trust in yourself. Be open to the guidance of Spirit and angels. Following their guidance is a guaranteed way to enjoy the gift of Divine Love. Sharing your spiritual path with your soul mate is a familiar desire known to us all. We pray for a soul mate that has similar philosophies and common interests. These prayers have been heard and you are to follow the angels lead. Release this partnership to them and listen for their whispers. They will elevate this relationship as you so wish it to be! My life radiates with Harmony and Trust. I faithfully remain open to the guidance I am given from Spirit and angels. 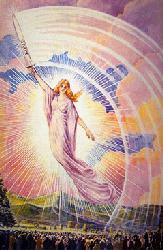 I am the Angel of Turning Points reaching out to you with... New Opportunities and Blessings. Your prayers have been answered. Now is the time for you to take action. New Beginnings will greet you on your path. Meet each one with great joy and expectancy! Every turning point in life is an opportunity to change your life for the better. Spirit will guide you through each one you meet along your path. Every bend in the road is unique and full of new blessings for you. The more you trust in Spirit the straighter your path becomes. wonderful new opportunities when they come knocking on your door. Each day is a New Beginning meet it with great joy and expectancy. Accept the guidance of Divine Wisdom. Become wiser in the actions you take that are in line with a quality of life that you were created to express. Reach out and touch life with all of your Inspiration! New opportunities reach out to me; I am Divinely guided in all that I do. for those who have no prefernces......... No expectations! everything becomes clear and undisguised...... Live your life with Love! and heaven and earth are set infinitely apart.......... No Comparisons Please! no opinion for or against anything...... Remain Open! is the disease of the mind......... Results: No Dis-ease! Remaining flexible! Flexiblility creates less stress in our daily lives. every where you go! Spirit sends me to give you... Awareness and Serenity! When you tune into the Divine source of Peace you find strength to overcome diversity. You find that turning on and tuning into your Spiritual life uplifts and nurtures you through any challenge. You are given many tools to help you through this process of tuning in. You have been given the art of beautiful music. The very computer you are on now reading this message that is being sent to you is a wonderful way of turning on and tuning in. Inspirational programs on television are yours to learn from. There are so many ways to quiet the noise of tension in your life. It doesn't matter where you are or what you are doing when you want to experience peace all you have to do is turn it on and tune it in. This can be easily done when you connect with the Divine source of Spirit. Become aware of how easy it is to do. Think it then allow the peace to enter your being. It's a sure way of saying good-bye to the stress! The peace of Spirit is within me and fills me with Serenity! We have all grown up counting our blessings in times of despair. Numbering them keeps us centered in ego and we learn zilch! Taking the time to thank our loving Source for all our blessings heals and allows us to grow whole. Life should be a matter of quality not quantity. Speaking of love, beauty, peace, and clarity raises your spirit and reveals every beautiful quality that dwells within you. We walk this planet only for a short time and we have to remember how to make the best of it with our talents and gifts we have been blessed with. Too much time is spent wishing and hoping beyond what is reality. Our time should be spent remembering who we are and what we are here for. When we are full of love and appreciation for the divine plan it is easier to see with greater clarity why we are here and that life is eternal! Growth and development occurs when we can free our minds of words that limit us and of all negative concepts we tend to place on ourselves, others, and life. Prayer helps to aid us in this. Praying with the angels to thank our loving Source for the beauty of life is an excellent path to healing and growing. Our angels carry our prayers to the Divine and bring to us His/Her message that promotes love and wisdom in all we do. I am full of love and appreciation for the Divine plan of Spirit! I am the Angel of Enthusiastic Attitudes declaring there are great possibilities in store for you. Greet life with enthusiasm. Your enthusiastic attitude is energizing you and all those around you. I will inspire you on your path of... Growth and Discovery! accomplish aspirations with effortlessness and ffectiveness. Enthusiasm promotes health by energizing you deep down to soul level. Tapping into your inner being as light penetrates a prism; it permits your soul to bring forth healing qualities. This energy introduces your body and life to a welcomed change. Enthusiastic energy generates circulation that restores health. It keeps things moving! your growth! Discovery becomes the mission you are on! Each day I welcome Growth and Discovery into my life enthusiastically! I am the Angel of Prospered Joy singing words of praise for you as you journey through life. Your joy spills forth into all that you say and do! You no longer look to others for the source of joy knowing it is found within you. You awake each day with... Spiritual Enrichment and Gladness! into your life you are free to live life as it is meant to be lived... Prosperously! because Spirit resides within. It's a wonderful feeling! When you honestly approach life knowing there is no amount of money that can buy the life that Spirit has given to you freely; you feel the comforting presence of Prosperous Joy! Each time you open your heart to the Spirit within your life becomes that of ecstasy! Breathe life in with gladness in your heart! I am prosperous and spiritually enriched by the guidance I am given! You have taken this path for a reason! Savor each step you take on it. Have faith that what ever is not for your highest good is being replaced or healed. The most challenging times when it seems you just cannot take another step in the direction you are headed is when you will be given the strength and courage to forge forward. alone but clearly being shown the way! It is through the flow of events in your life that brings change. While change can be scary it can also introduce renewed will power to overcome insecurity and weakness. Will power strengthens and instills the courage to never give up on what you believe in! I hold each day of my journey through life in the light of wisdom! joining of your heart and soul living your life with... Kindness and Compassion. Heart and Soul of togetherness makes beautiful music come to life. Being connected with people brings beauty to life! There are some that you will always feel connected with regardless of age, distance, or anything else that could separate you. There will be others whom you thought you were still connected with only to find out that somewhere along the line you disconnected. Then there are people that you will never connect with no matter how hard you try. connected! There is reason for everything and for everything there is a reason. The Heart and Soul together makes beautiful music come to life! interfere with the peace that fills your day! Blessing the stress gets rid of DISTRESS! Remembering to bless each stressful situation we find ourselves in helps to alleviate the miserable feeling that is drawn to us. There isn't any reason to go around all stressed out when we have Spirit and angels to help rid our lives of it. The next time you find yourself in a stressful situation bless it and move on. your dis-ease you are opening your heart to love, graciousness, and peace. get to it before it has a chance to ruin a your day! Make every day a beautiful day free of stress! Every day I bless the stress and eliminate DISTRESS! give you. Proceed without fear! Don't let fear keep you from making your dreams a reality! When something feels right to you "GO FOR IT!" You have all the support you need to accomplish any task you set out to do. The guidance is there for you, ask for it when in doubt. Guidance gives you the strength and the pat on the back needed for inner resolve. Recognizing it is all that it takes to move forward. When you feel you are at a crossroads in your life give yourself the means to free yourself from the past and prepare for renewal. The past keeps you stuck let go of it! Be ready for when the new beginning comes. It will come! Prepare now to succeed beyond your expectations! You have been given all you will ever need to be successful in life. Spirit is guiding you down the path that will lead to your joy and happiness! Don't be afraid to take those once in a lifetime opportunities that you may think as a one time chance or a stroke of luck. In Spirit nothing is left to chance! I release the past enabling me to move forward to make my dreams a reality! all you do. Learn the art of letting go and liking it. Open up your mind to... Suggestion and Guidance. Giving yourself permission to love life for all that it is means you have to let go of all that is past and live for today! You have to trust and love yourself regardless of anything that you have been through. Trust that you are headed in the right direction and love the outcome of each moment you encompass. opening up to the ultimate gift of peace. You get that ahhhhhh this is a nice feeling all over. Attitude is important when it relates to growth. How you look at yourself and life is up to you. Looking at it with an attitude of gratitude is a much easier path to take with you on your journey. Accepting guidance and suggestion is the first step to growth. How you relate to others guidance and suggestions reflects how open you are to newness in your life. Don't get stuck in life bypassing great opportunities to grow. Remember you can always take what you need and leave the rest! I am always open to the power of suggestion and guidance! I am the Angel of Moving On Up bringing you a scope of new activities and responsibilities. You no longer feel the need to continue your old routine. With my help you can soar beyond your wildest dreams. Your success is yours when you open your heart to... Divine Guidance and Rejuvenation! Divine guidance and rejuvenation are constant! Every day you are renewed! Divine power guides you toward fresh and new. Regardless of the path you are on, with Spirit beside you it is a given you will always move forward. Remember this when you are feeling stuck. back to where you left off. Perhaps you found yourself stumbling along the way. Rest assured that you have help in getting back up! Keeping Spirit close in your travels gives you stamina and support to keep going forward. Another feeling is up hill climbs while proceeding on your journey. Feel the challenge of the climb and rejoice when you reach the top. It won't always be easy but with Divine guidance and the rejuvenation to lend support... YOU WILL MAKE IT! I joyously release old routines and accept willingly new activities and responsibilities into my life! each person you meet and greet along your path. Remember this feeling! Teach the world to sing in perfect harmony! goodwill will light up the world! Bring the light of love and understanding with you wherever you go. Permit your world to glow with Harmony! creating a masterpiece! Your master piece! You have the world at your fingertips and it's entirely up to you to create beautiful music of peace and harmony! Conduct your very own symphony! You are Spirit's instrument of Peace. Peace and Harmony are waiting to be played through you. Set your world aglow with the light of Harmony! Bring every person into your song of peace. Serenity is just one note on the chord of life that results from the glorious music you produce in your world! Teach the world to sing in harmony! I am the conductor of my life and only produce music that is harmonic and peaceful! others the wonders your world has to offer! Do this with... Awareness and Sensitivity. the time to appreciate and hold sacred your students in life, regardless of their moods or personalities. When maintaining an awareness and sensitivity you enhance others along the way. You are teaching them, preparing them to become teachers as well. Show them how prevalent it is to rejoice with them and pray with them helping them to become all that they can be. Bringing the beauty of your world into their world. Let your knowledge motivate them joyously enriching their life. Reveal to them your unlimited love. Guide them tenderly. Remember that a satisfied soul will bless you in all ways! You are a well of knowledge share it with love! A good teacher always remembers to listen with love and guide with tenderness! compassion. I ask that you live your life fully and freely by being the best person you can be! Embracing the gift of life is not always easy to do with love and compassion. In today's hectic hustle and bustle it is easy to forget it is a gift at all. Taking time to reflect on what life really means and its purpose helps keep us on track making it somewhat easier to appreciate it! Learning how to let life be expressed through you will show you the true meaning and purpose and allow you to benefit from all of it's moments. Centering your attention on the love of Spirit enables you to infuse everything you think, do and say with love and compassion. There are so many things that will show you the grace instilled in life. Spectacular sunsets are full of Spirit's grace. When you think you could not see one more thing that is enriched with the grace of Spirit it is then you will witness anew. It is through the grace of life that your spirit is renewed with love and compassion! My life is beautifully expressed through the grace of Spirit! One of these days is yesterday with its mistakes and cares, Its faults and blunders, Its aches and pains. Tomorrow's Sun will rise, either in splendor or behind a mask of clouds, but it will rise. It is only when you and I add the burdens of those two awful eternity's - yesterday and tomorrow that we break down. It is the remorse of bitterness for something which happened yesterday and the dread of what tomorrow may bring. learn that through Spirit's peace nothing can place demands on your life! When you allow the peace of Spirit to fill your heart nothing can upset or disturb you. You become liberated from such illusions as you welcome the guidance from Spirit that helps you to respond to every person and situation. Negativity vanishes when you learn not to give it your attention. You can choose how to direct your thoughts. You are the one who gives your thoughts power, no one else can do that for you. disposition. You begin to meet life with grace and a sense of humor. It really doesn't benefit us to live life in the negativity zone! With the peace of Spirit resonating from within me I am free to live life in a positive mode! I am the Angel of Earth Bound Action giving you... Strength and Persistence. I want to teach you to move forward in life by conveying qualities and secrets that reveal your inner power. I am answering your questions and it is now time for you to give shape to what is before you. Do not delay or postpone your progress! Keep your thoughts positive! This angel's presence in your life will uplift your energy enabling you to overcome any obstacle or lack of vigor with which to accomplish new endeavors in life. Magic enters your life when you accept this angel's spiritual guidance. I am always able to clear away doubts and confusion with the help of my angels! Angels Share The Message, invite a friend!